Last Saturday, after almost three weeks of mist and showers, the thick layer of grey cloud that had been pressing grimly down on the Hebrides, cleared away and the sun shone on the north of Skye. We – that is me, the husband and our house guests for the past week, the daughter and her boyfriend – grabbed boots, waterproofs, walking poles and backpacks and headed out on a hike. Waternish Point was our destination. Having parked the car opposite the ruined church at Trumpan, we set off. 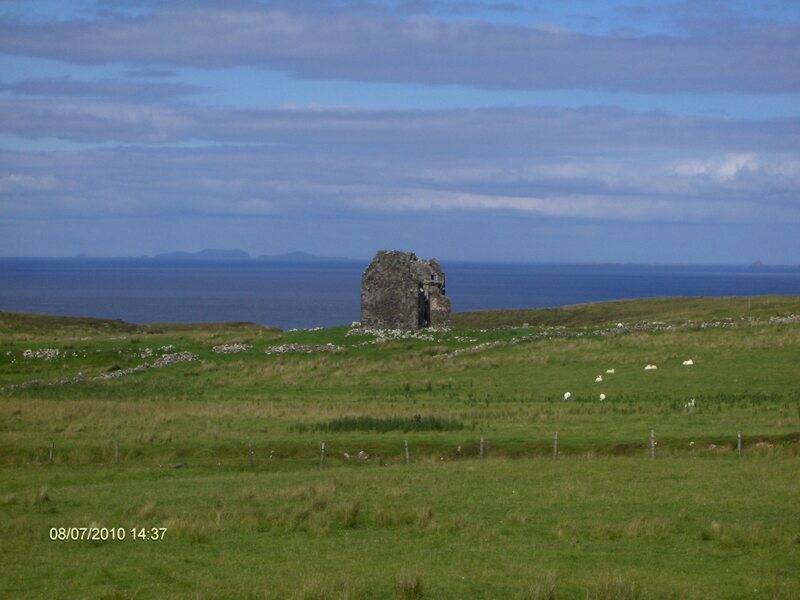 It’s an eight mile, circular route to the lighthouse and the deserted settlement of Unish on the northern tip of Skye’s Waternish peninsula. We’ve done the walk several times before and it’s always delightful. This time was no exception. As we set off along the rough cart track, I already felt better. I think I’d begun to suffer from an out-of-season bout of S.A.D. during our mostly dismal July. I guess the full spectrum light went straight to my sun-starved pineal gland. The sky was an almost cloudless blue and the sea air was invigorating. The walk goes over heather moorland and peat bog. Because of all the recent rain, the going was very wet in places but our walking boots and waterproof trousers did their jobs. There was a fair bit of scrambling and jumping to be done to avoid the deeper puddles and the squelchier areas of muddy bog. But that all adds to the fun. The view westwards to the Outer Hebrides, as always, made us stop and stare. Over a glinting, sparkling sea crouched the island of North Uist. As we watched, a small, white-sailed boat made good progress in the strong breeze. 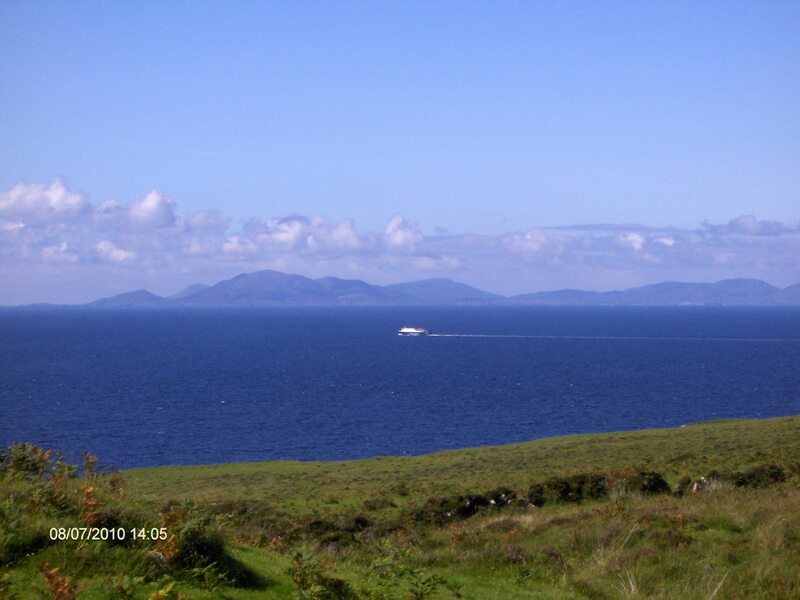 The Cal-Mac ferry also appeared round the headland on its regular and frequent route from Uig on Skye to Lochmaddy on Uist. And looking north there was Harris – its purple mountains and white sandy beaches seemed very close on this bright, clear day. I thought again how we really must make the effort and go and visit the Western Isles. We can see them from our living-room window but have never ventured over. We continued on our way. 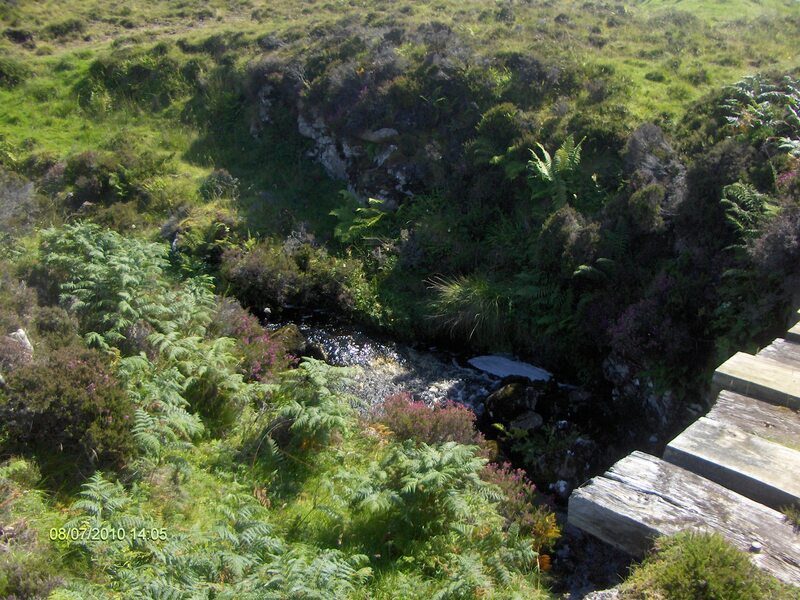 We crossed a shoogly, makeshift bridge over the fast- flowing burn – its water peaty brown. 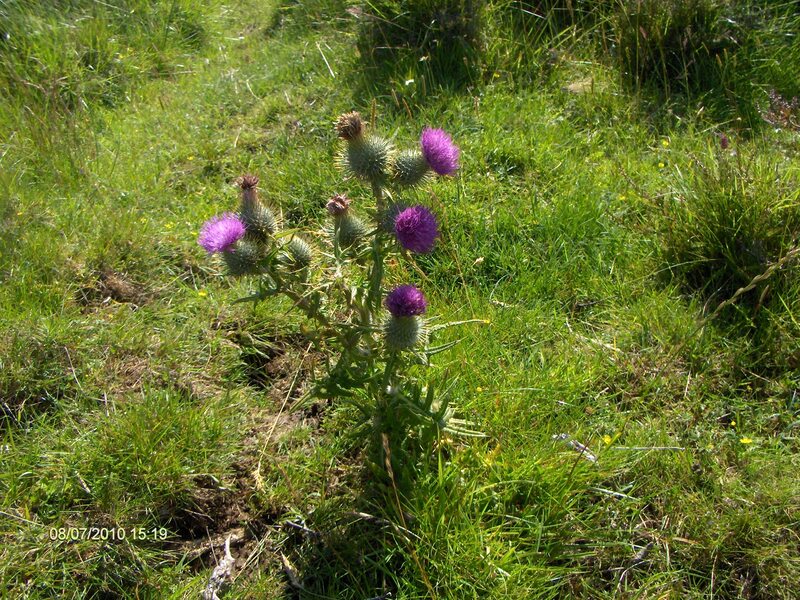 The moor was covered in purple heather, and thistles bordered the path. Yes – living Scottish clichés. 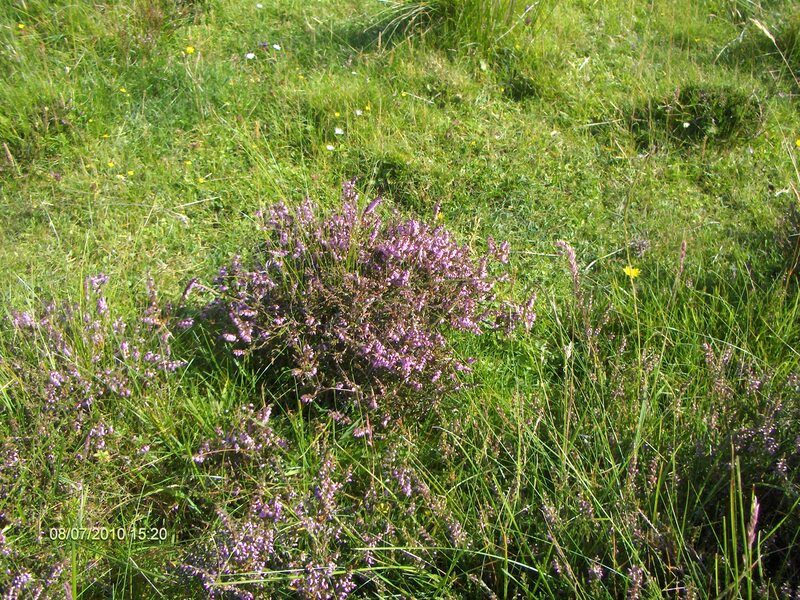 And the bonny, bloomin' heather. Okay I'll stop now. There were plenty other, less emblematic, wildflowers on show as well. 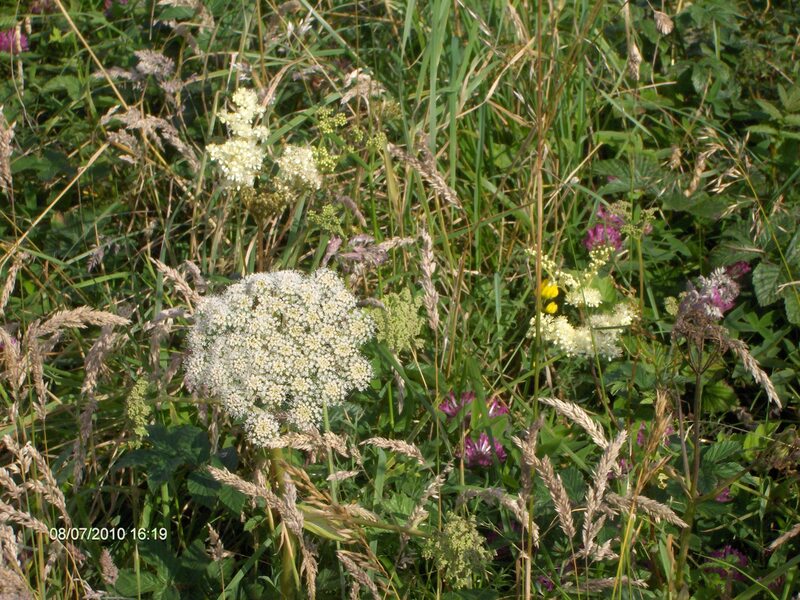 Red clover, purple knapweed, wispy white cotton grass, buttercups, daisies, rosebay willowherb, white meadowsweet and angelica – all bloomed in colonies, clumps, singly and in swathes – depending on their preferences. I heard curlews calling, probably from their nests out on the moor, but didn’t actually spot any of these shy birds. I did see a little wheatear sitting on a rock beside the path – it flew off as soon as I approached – and shag circled and called overhead all along the walk. 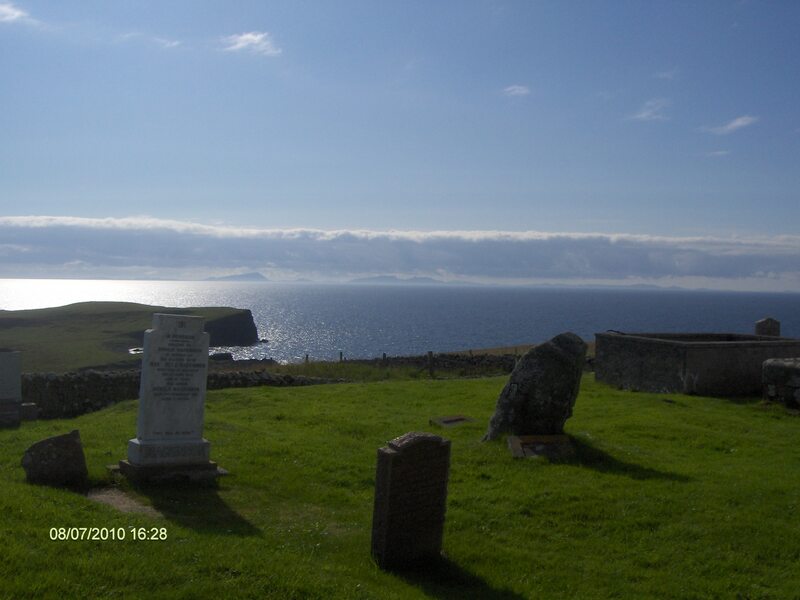 We passed below two cairns –monuments to John and Roderick Macleod, a father and son, who both died in a clan battle with the Macdonalds in 1530. 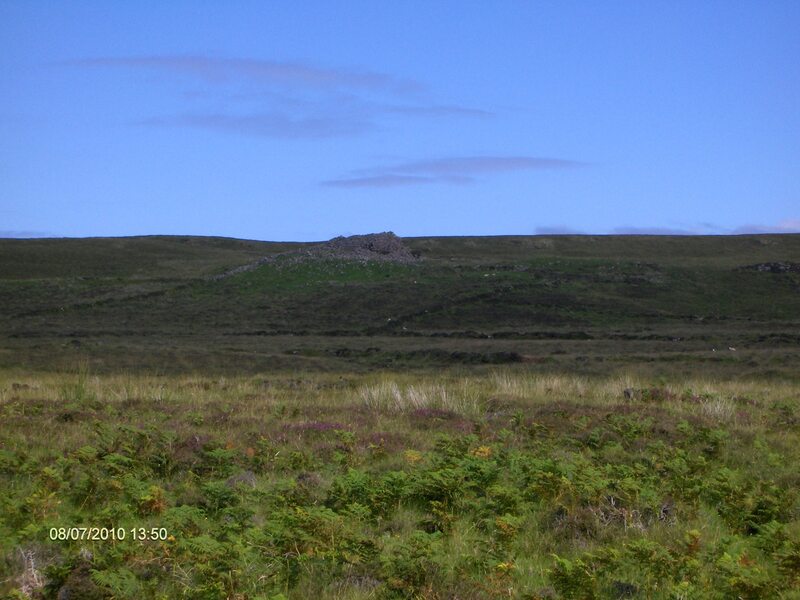 We also pass the ruins of two hilltop Iron Age (about 200BC) brochs – or ‘duns’ to use the Gaelic name – Dun Borrafiach and Dun Gearymore. Duns were stubby, cone-shaped, circular buildings. They were fortified dwellings, built using the dry stone technique – a technique still in widespread use. They would have had staircases leading to different levels and would have provided shelter to both animals and humans. The clear and open view from both duns would have meant it would have been very difficult to take the residents by surprise. I paused, as I always do below the these ancient homes, trying to imagine the lives of the Picts – these pre-Scots – who’d have lived, loved, raised children and died here. The physical landscape would be the same, apart from the cart track. They’d have grown root vegetables and raised cattle, sheep and pigs much like modern Highland crofters. Yes, life was probably more’ nasty, brutish and short’ than now, but I guess their daily pre-occupations were similar to our own. Standing by the remains of their homes never fails to inspire images of the ancestors who gathered and piled the stones and worked the land. 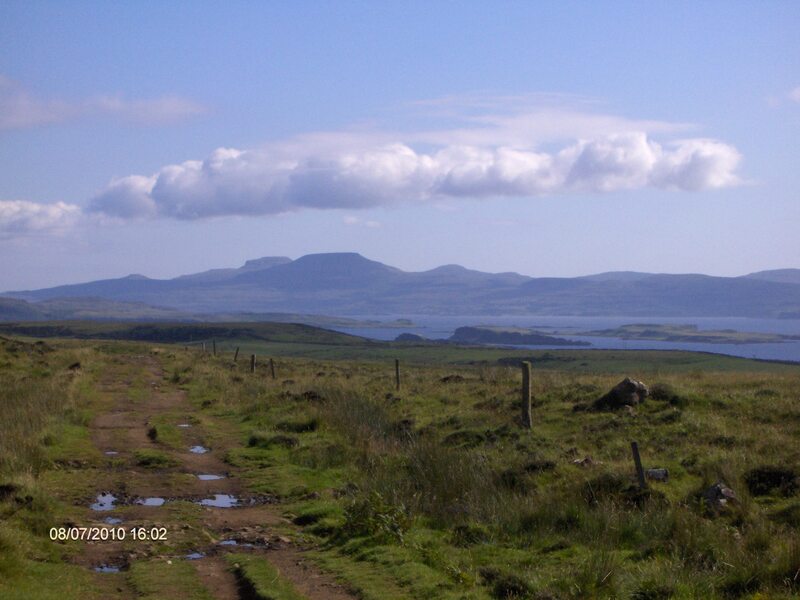 Pictish genes are probably present in many present-day Scots and standing on the same land, looking at the same sea and mountains, hearing the same birdsongs has the effect of telescoping the intervening time between us and them. And last Saturday, as I stood where they’d have stood, differences of pace and technology fell away and it was the similarities that remained. 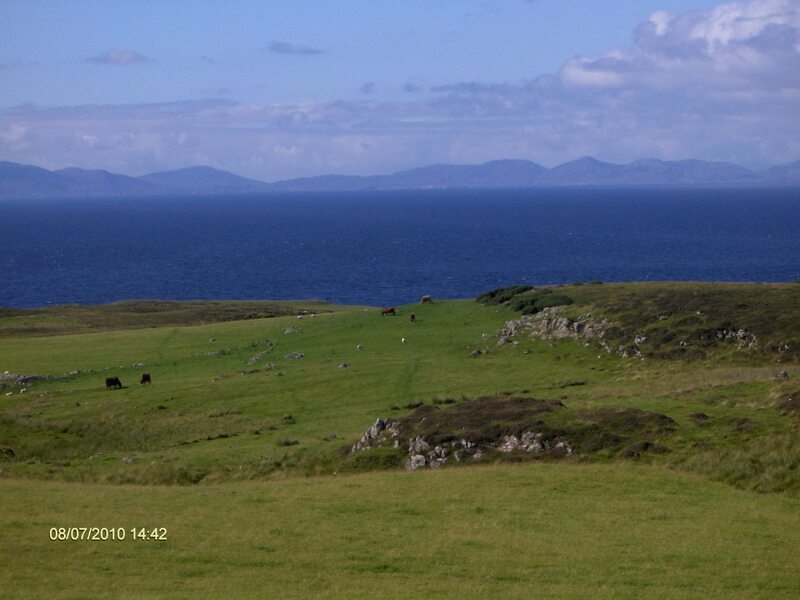 After the duns, the track bends slightly eastwards and we got our first glimpse of the lighthouse. Sighting the lighthouse spurred us on just as we were all flagging. We picked up the pace and strode on. We passed a rabbit warren on the left of the track and paused to watch several of the residents scampering about. 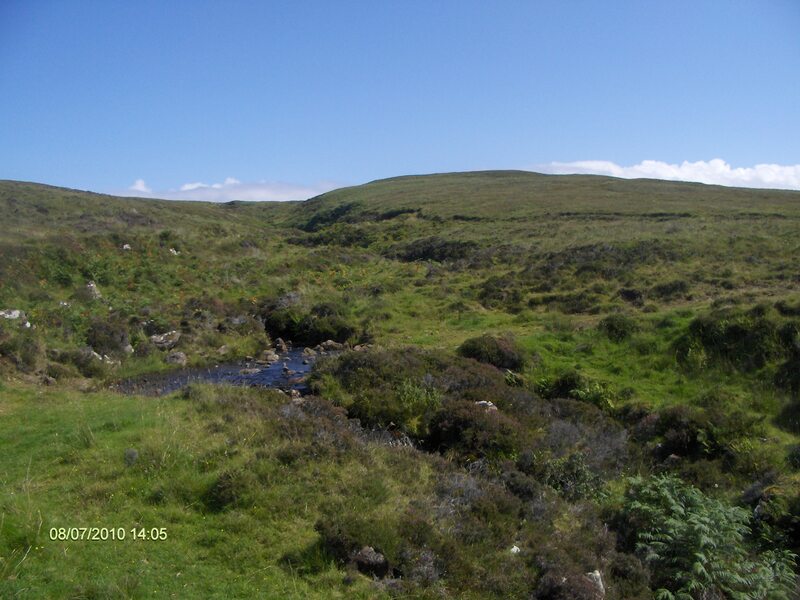 Soon we turned left and headed west once more, following the sheep track down towards the former crofting township of Unish. Only one house remains – roofless, granite-grey and stark against the landscape. The other houses and byres are reduced to a single layer of stone marking out their boundaries. The former residents were burned out and driven off their land during that most infamous period in Scottish history, the Highland Clearances. From the 1840s to the 1870s, landlords oversaw these enforced removals in order to replace poor, low yield, peasant farmers with much more profitable sheep. Their former tenants were forced to emigrate. Even on the brightest day, the atmosphere around Unish is eerie and haunting. I got a completely different feeling standing in this rubble from what I’d experienced further back at the duns. This time there was no connection – just a sense of sadness and dislocation. 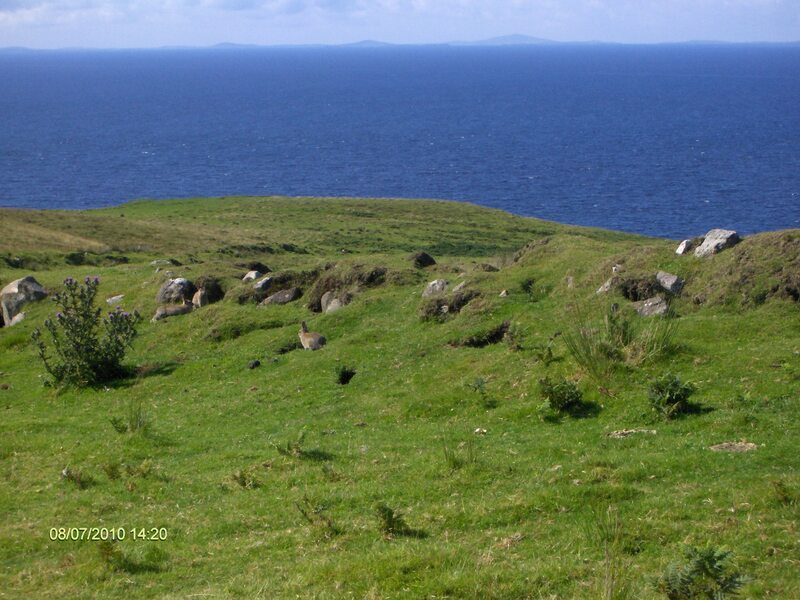 We climbed up a small hill above Unish and sat in sight of Waternish’s rather short and stubby lighthouse. We had a welcome snack – kitkats and water, took photos of each other as trophies of our hiking achievement and then just sat for a while, a part of this ancient and timeless landscape. We returned, simultaneously footsore and exhilarated to the car park at the church where our walk had begun. I spent some moments in the ruined church before getting into the car. 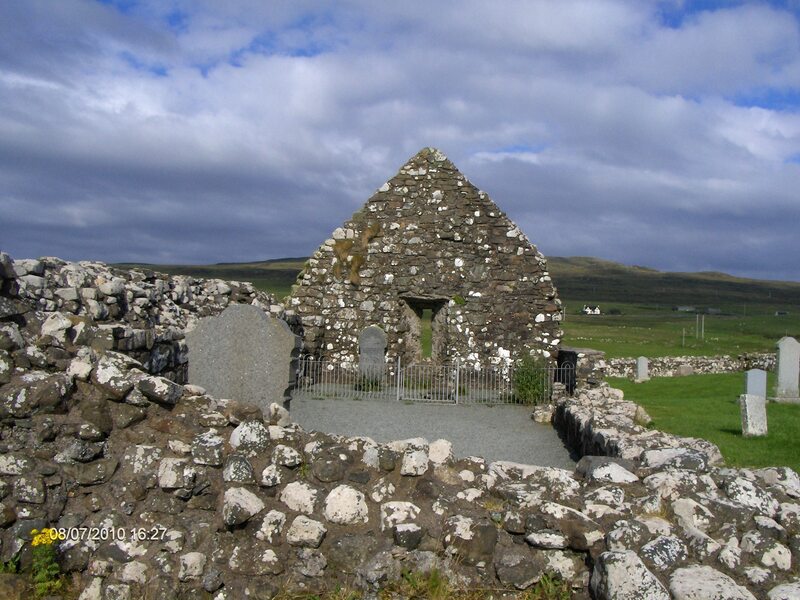 The story goes that Trumpan church was burned down by members of the clan Macdonald, in 1580, while their enemies the Macleods worshipped inside. So this is another place of ghosts. 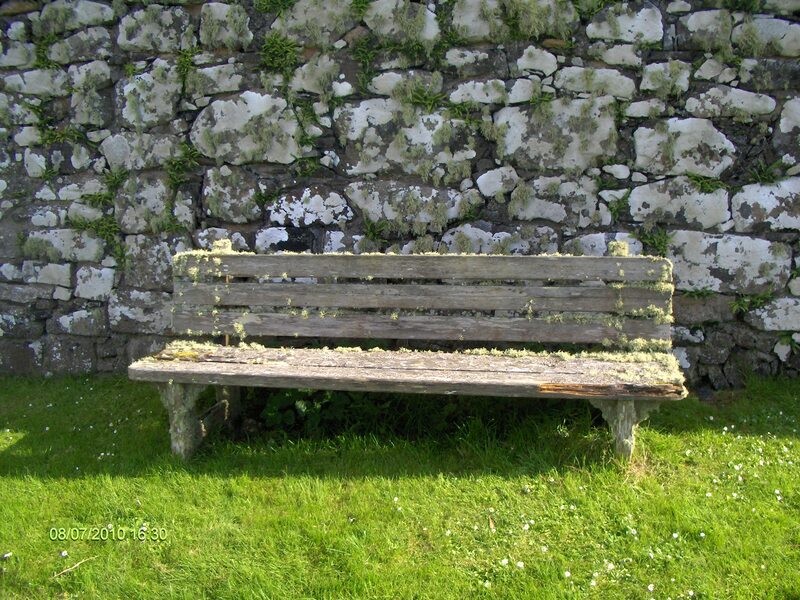 I sat on the old lichened wooden bench and reflected for a bit on how hundreds of years later we still allow carnage to take place, justified by our tribal concerns, jealousies, beliefs and mutual mistrust – only the size of the stage has changed. I think reconnecting with the landscape makes a person see how pointless a lot of the conflict was and is. Doing the walk again and sitting in the churchyard was a bit weird for me at times, as the two main characters in my new novel – the work in progress – take this same walk and talk about displacement and dislocation, two of the novel’s main themes. I half expected to meet the pair of them. 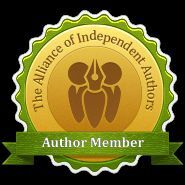 Writing fiction can mess with your head! And then we were home. Boots kicked off by hot, grateful feet, chilled beers and slices of cake (baked earlier by the daughter) swiftly downed. Daughter and I cooked dinner together – something we both enjoy doing whenever she’s home. We made a creamy, beef stroganoff. Daughter’s boyfriend had not yet experienced this culinary family favourite, and this would be a further initiation into Stormont customs for him. He quickly cleared his plate – approval enough – relief all round. This was an end-of-holiday meal for the two young people. Their week with us passed too quickly. Heck the daughter’s whole childhood passed too quickly. They’d be returning to their lives in the city the next morning. I was missing them already – and that breath of fresh air our children bring to us. Saturday was a lovely day and one when I was aware of the landscape – internal and external – and more than usually aware of the passage of time. Like this Post and others too?